I keep finding some pretty amazing places here in Nicaragua. Omotepe Island is one of those. 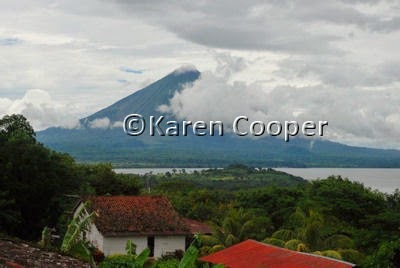 Ometepe Island is formed by 2 volcanoes, Maderas and Concepcion, with an isthmus between. She sits in Lake Nicargua and boasts at being the world's highest lake island. Ometepe is incredibly beautiful. From the ever-changing views of the volcanoes to Howler monkeys, tales of pirate treasure to some of the best coffee I have ever tasted, this island paradise slowly seeps into your soul. There are few places on earth that I feel an instant affinity for. Ometepe Island is now one of those. It's almost impossible to describe this feeling. You just know it "is." And once you accept that these things happen in life, then you can sit back and let the Earth Spirits work their magic on you. And know that there will always be this place here on earth that you will feel you belong to. This island seems fantastic. After I save up for my trip to Grenada, I will now have to save up to go there. So beautiful it almost seems sureal! You are exploring a part of the world that is so beautiful. I will see it thru your eyes. Thank you.